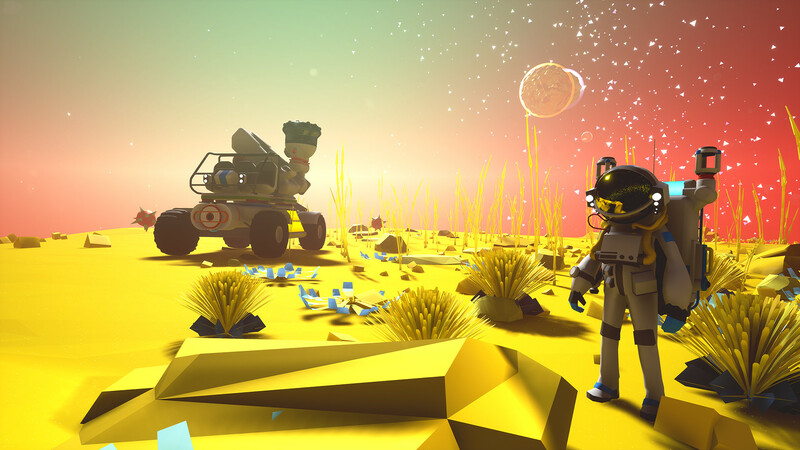 System Era, the developer behind the endearing survival sim Astroneer, have revealed their all-new Research Update for the game. The update gets its name from major changes to the Research system. Before now, when you researched random objects you found in the world, you would randomly get schematics or resources. Now, research awards Bytes, which players can use to buy the schematics they want. "As part of our Alpha launch, we wanted to lay a solid foundation by updating our core game loop," said System Era in the patch notes. "The new Research Chamber is our first platform using "streaming" power, a system we are going to move to completely in the future. Now, rather than placing a research chest on the platform and getting a random item, you research objects to accumulate data, which you can then use to unlock whatever items you would like from your backpack. Research Chambers require a constant flow of power to continue gathering Bytes." With the new Research system, System Era has added a Catalog to the backpack, allowing you to spend Bytes for new schematics. The streaming power system is a big change from the previous drain-and-refill system that Astroneer's base camps used before now. System Era also made a host of smaller changes, like UI updates, resource color changes, and a new in-game tutorial. With the game in the Alpha phase, the developer is promising new changes and additional content for future patches. The patch notes for the Research Update include the planned feature roadmap. In the first quarter of 2018, System Era is planning to add more robust base-building, and a new weather and hazard system. "Right now the team is working on some elements that will will completely change how you build your bases, and creating "tiers" of base modules that will scale up as your Astroneer starts to master the solar system. We want there to be a sense of progression when creating bases, so that your initial base looks way different than a base belonging to a seasoned Astro. That doesn't just mean bigger, that means more complex, but also more rewarding," said the team. The second quarter of 2018 will offer dedicated servers and a rework of the game's terrain systems, allowing for better planet and biome creations. When I played Astroneer earlier in the year, I found a game that was most of what I wanted out of No Man's Sky in a more enjoyable package. I'm glad to see the developer is committed to further additions. Astroneer is currently available on Steam Early Access and the Xbox Game Preview Program. Tagged with News,	PC,	Steam Early Access,	System Era,	Xbox One.